Sir Hurt, as he really should be known as, given the fact he was most recently knighted by Queen Elizabeth II before recently meeting his maker in the stars, was undoubtedly a thespian. And we don't say that lightly. Sure, plenty of actors held their prestige in the film industry in fabulous ways, but hardly many truly worked the industry for a multitude of projects we never even knew they starred in! But let's be honest here at SHS -- Yes, Hurt played Kane from ALIEN (still a strong franchise we've heard). Tremendous and momentous, iconic. And, yes, he played the same role in SPACEBALLS! Again, timeless. He was also in HELLBOY and V FOR VENDETTA as well as HARRY POTTER 1, 7, and 8, so undoubtedly we recognize him for that mystical aspect of a British hardened soul capable of emitting such aura that even the cheesiest of horror films would be kicked up a notch by his mere presence. I mean -- look at him, for crying out loud. Listen to that ethereal voice of his. Sure, he ain't Sean Connery (he doesn't have to be). But you definitely feel like you're in a gothic-type modern horror flick with John Hurt next to you. A true thespian like Sir John Hurt would take on projects and never even be "credited" as a headliner, though. And the fact is this: he did. 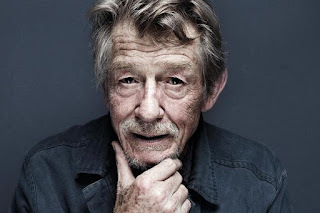 That's the making of a craftsman -- and, yes, indeed -- John Hurt definitely made his mark in cinema with these three movie roles (and much, much more) you never expected he had ever played!